Israeli Prime Minister Benjamin Netanyahu has announced his party’s election victory, with Likud scooping at least 29 seats in the 120-seat legislative body Knesset as nearly all votes in Israel's election have been counted. 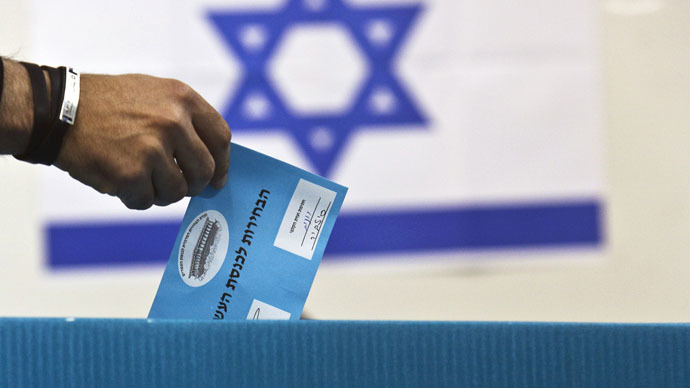 Israeli elections timeline: 4th term or end of Netanyahu era? Official results give Likud 29 seats while Herzog's Zionist Union will get 24 in the 120-member parliament - a wider gap than was projected in exit polls and one which will likely facilitate building a governing coalition for Netanyahu. "Against all odds, we achieved this huge victory. Now we should form a strong and stable government that will be able to take care of the security, safety and welfare of each and every citizen of Israel," Netanyahu said, while speaking to his supporters. In a statement, Likud said Netanyahu intends to form a new government within the next few weeks, while negotiations are already underway with the pro-settler Jewish Home party, led by Naftali Bennett, as well as other religious groups. His main rival, Isaac Herzog from the Zionist Union said he had called Netanyahu to congratulate him on the election victory. "A few minutes ago I spoke with Prime Minister Benjamin Netanyahu and congratulated him on his achievement and wished him luck," Herzog told reporters. Even despite the defeat, Herzog says that he will make”every effort”to form a coalition. The party also slammed their rivals for starting to celebrate their victory prematurely. "The rightist bloc has shrunk. Everything is possible until the real results are in, when we can know which parties passed the electoral threshold and which government we can form. All the spins and statements are premature," the Zionist Union said in their statement late Tuesday. However, by Wednesday morning, as results from 99 percent of polling stations had come in, Netanyahu already seemed set to get green light from Israel's president to start putting together a coalition. Earlier, Channel 10 and Channel 1 said the two opposing parties secured 27 seats each in the 120-member parliament – the Knesset. Channel 2 said that PM Benjamin Netanyahu's Likud finished with a narrow victory, winning 28 seats to the 27 of Isaac Herzog’s Zionist Union. The Tuesday election proved to be a test for Israel's long-serving PM Benjamin Netanyahu, with the vote having been predicted to be a closely-fought battle. While Netanyahu stayed true to his hardline policies, having once again announced on Monday that he would not allow the creation of a Palestinian state, the Zionist Union concentrated their election campaign on social and economic issues. Voter turnout in the election has surpassed 2013 attendance levels, with over 70 percent of 5.9 million eligible voters declared to have attended two hours before the polls closed.